Sometimes, you just have to do it. You know that upstanding citizens would frown upon you. Your friends tell you it's not worth the risk. Your spouse looks at you in horror. But you still can't escape, you have to do it. 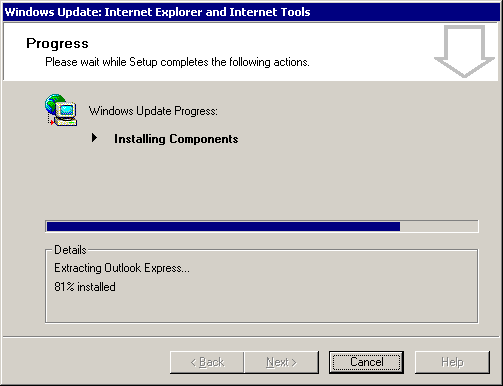 You have to do a fresh install of Windows 2000, even in 2014. In my case, it was a legacy printing system which doesn't even play ball with XP. The SP4 installation went fine onto a HP dc5100 SFF, drivers loaded okay, the printers and the print software installed without problems. Test pages were printed, but Windows 7 clients couldn't access the box. My guess was the lack of NTLMv2 support, or possibly outdated CA certs. No problem, Windows Update to the rescue. The small web installer on the MS download site will fail, so you'll need the full installer. It should install fine, reboot. A few reboots later you should be able to access the Windows Update site and download about a 100 updates, more if you installed .net and/or Office. As for modern browsers: IE6 SP1 is the max, forget Chrome, and Firefox can go up to version 12.